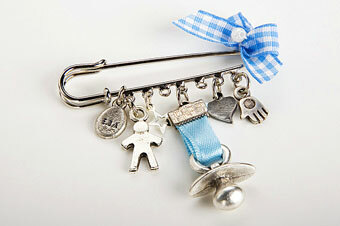 Hang this unique decorated safety pin on your diaper bag or stroller and upgrade their looks! The pin has five charms to protect the new mom and baby from the evil eye. The Hamsa is a symbol used in amulets, charms and jewelry to protect against the evil eye. Hanging the pin on the baby’s stroller or on mom’s diaper bag will protect the baby from the evil eye and will bring fortune and good luck for mom and baby! Ideas from the heart! 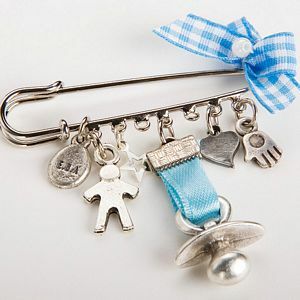 This pin makes a unique gift for a baby boy or baby girl shower for the new mom and new baby. 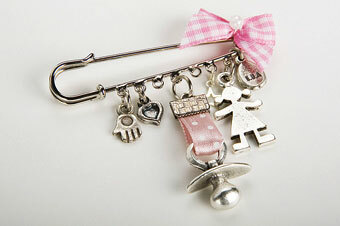 The pin has five charms: Baby boy or girl, hamsa hand, loving heart, pacifier and leaf. 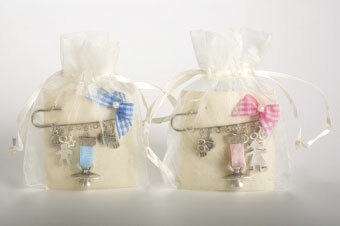 The pin is attached to a recycled paper and is beautifully wrapped in an organza cream color gift bag. The Pin is 2.2 inches long. The pacifier charm drops 2 inches from the top line of the pin. Made of silver plated metal.